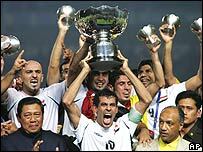 Iraq clinched their first Asian Cup victory with a 1-0 win over Saudi Arabia in Jakarta. Captain Younes Mahmoud planted in a towering header for the winner after Saudi keeper Yasser Al Mosailem flailed despairingly at a corner. Al Mosailem had earlier kept his side alive with a fine double save from Younes Mahmoud and Nashat Akram. Iraq had an escape in stoppage time when Saudi striker Malek Maaz bounced a header on to the roof of the net. The final had been billed as a contest between the tournament's best attack in Saudi Arabia, against the tightest defence, but the Saudis much-vaunted strikeforce was kept well in check. In contrast, Iraq always looked dangerous on the break, with man-of-the-match Younes Mahmoud's pace a particular threat. Younes Mahmoud gave a hint in the first half when he acrobatically connected with a cross to draw a save from Al Mosailem. Iraq's Karrar Jassim showed brilliant skills to trick his way past two defenders in a tight space, but his shot from a narrow angle was saved by the Saudi keeper. Iraq keeper Noor Sabri Abbas was alert to produce a fine save to deny Taiseer Al Jassam on a rare Saudi raid. But the Iraqis were sent into raptures on 72 minutes when the keeper flapped at a corner and Younes Mahmoud rose to plant in a header. As the Saudis pushed for an equaliser, Iraq had several chances to kill off the game, but their failure almost returned to haunt them in stoppage time. Iraq keeper Noor Sabri missed a cross and Malek Maaz's downward header bounced up and over the bar on to the roof of the net. Iraq's Brazilian coach Jorvan Vieira worked under difficult conditions, including being forced to prepare the team outside of Iraq. He said: "We all know the problems in Iraq but I have learned they are a fantastic people. "We did not have much time so we had to work quickly. We sometimes fought, we sometimes argued but we got the work done. "It was very difficult but I am very proud of these boys." Vieira announced he was standing down after the victory.